The paper deals with the problem of efficient energy resources consumption when processing blanks of machine parts by means of cutting tools. The energy efficiency increase of technological processes is considered as a necessary factor to ensure national production competitiveness of the mechanical-engineering complex. The problem of increasing energy efficiency of the cutting process is multi-staged. The paper considers a number of techniques to optimize the provisions for the cutting process: geometrical parameters of the cutting part of the tool and the values of processing modes. The paper presents a new integral index of energy efficiency (power efficiency) of the cutting process, which is, in fact, a ratio of processing energy density to the processed material strength. The paper gives a number of calculation-empirical methods to determine energy efficiency criteria, following the example of processing a rectangular groove by a horizontal milling machine disk cutter. Implementing the optimization technique can reduce energy costs in the cutting zone by 12-18% compared to the processing provisions based on the modes provided in General mechanical-engineering reference books. Keywords: mechanical engineering, technological system, materials cutting, a cutting tool, power efficiency, energy expenses, power consumption. Karpov A.V., Ignatov S.N., Raspopin A.P.Ocenka jeffektivnosti lezvijnoj obrabotki s ispol’zovaniem bezrazmernogo jenergeticheskogo kriterija [Evaluating the effectiveness of the treatment of the blade using the dimensionless energy criterion] // STIN, 2004, № 12.– P. 23-26. Karpov A.V. K voprosu snizhenija jenergojomkosti tehnologicheskih processov obrabotki rezaniem [On the issue of reducing energy intensity of technological cesses machining] // Sovremennye problemy nauki i obrazovanija [Modern problems of science and education], 2013, № 2; URL: http://www.science-education.ru/108-8697. Karpov A.V. K voprosu upravlenija processom rezanija na osnove jenergeticheskih zakonomernostej deformacii i razrushenija tvjordyh tel [To the question of management of cutting process on the basis of power laws of deformation and destruction of solid materials] // Mashinostroenie i bezopasnost’ zhiznedejatel’nosti [Engineering industry and life safety], 2011, № 1. – P. 37-49. Karpov A.V. Optimizacija processov obrabotki rezaniem na osnove jenergeticheskih zakonomernostej deformacii i razrushenija materialov [Optimization of сutting processes on the basis of the energy patterns of materials deformation and fracture] // Mashinostroenie i bezopasnost’ zhiznedejatel’nosti [Engineering industry and life safety], 2012, № 1. – P. 58-64. Karpov A.V. Jenergeticheski jekonomichnye rezhimy rezanija [Energy-saving modes of cutting] // Mashinostroenie i bezopasnost’ zhiznedejatel’nosti [Engineering industry and life safety], 2008, № 5. – P. 138-144. Starkov V.K. Fizika i optimizacija rezanija materialov [Physics and optimization of cutting materials]. 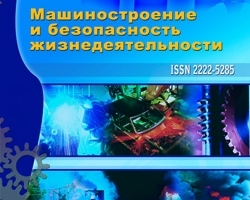 – Moscow: Mashinostroenie, 2009.– 640 p.
Jakubov F.J. Jenergeticheskie sootnoshenija processa mehanicheskoj obrabotki materialov [Energy ratios machining process materials]. – Tashkent: Fan, 1985.– 105 p.